Mature Size: 8-16' high and as wide, depending on cultivar. 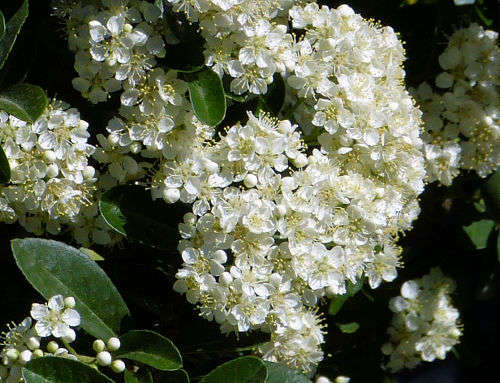 Flowers: White, tiny, grouped in slightly rounded clusters, showy, fragrant. Fruit: Small, showy, bright yellow, orange or red clustered berries that ripen in fall and persist into winter. Leaves: Dark green, small, narrow, tapered ends are rounded or pointed, edges are finely serrated. Some leaves turn copper-colored in the fall. Roots: Considered invasive in many parts of the country. This plant will regrow from its roots when cut to the ground. A tree stump poison is the easiest way to remove this plant. Toxic / Danger: Numerous thorns. 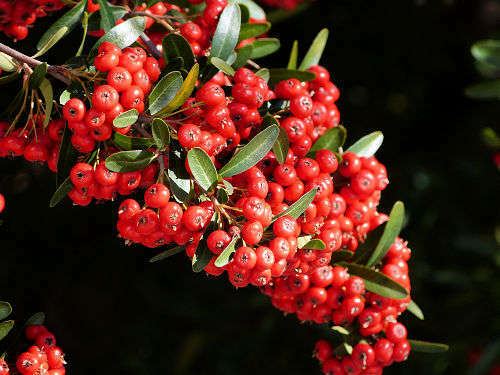 A few species of pyracantha have toxic berries but the berries of this species and most cultivars sold in nurseries are edible when cooked. USDA hardiness zones: 6-9. Some cultivars can be grown in zone 5. Heat tolerant: Yes. Extra water may be needed. Water after becoming established: Monthly to weekly depending on temperature. Soil: This plant tolerates all soil types but does better in acidic or slightly acidic soil. In alkaline, wet soils, the plant is prone to iron chlorosis. If the plant is in poor soil and is too rangy, adding compost as a mulch once a year will help it become bushier. However, if the plant is grown in highly nutrient-rich soil, or receives too much fertilizer or too much water, it will become more prone to disease. Prune: Prune so as to shape, maintain size and develop a strong structure. Spring pruning reduces berries but improves next year's blooms. Pruning in winter substantially reduces next year's blooms and berries but allows the current year fall berry color display. This plant can be trimmed into a hedge or espaliered. It tolerates severe pruning. Use heavy gloves to fend off thorns. Propagation: Cuttings of semi-hardwood branches are the most successful. Seed may need three months of cold stratification and is non-viable on many cultivars. Pests: Fire blight, a bacterial disease. Fire blight will turn leaves brown, cause branch dieback and brownish, liquid-soaked lesions on bark. It can even kill the entire plant. It is spread by rain, wind, insects, and contaminated pruning shears. Some cultivars are more resistant to this disease than others. Uses: Ornamental, barrier plant, bird garden, erosion control on slopes. The fruit can be cooked, strained, and the apple-like juice used to make jelly. Many recipes add sugar and lemon juice along with pectin; some add lime juice and chipotle pepper. This plant is a member of the rose family (Rosaceae) and is prone to fire blight. It should not be grown near other members of the rose family that are particularly susceptible, especially pears, quinces, apples and crabapples. The primary infection point is flowers. Plants that bloom early are somewhat less prone to infection than those that bloom late.